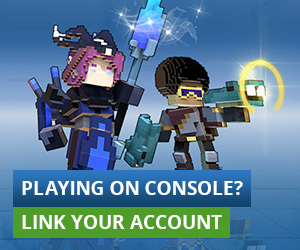 Trove Open Beta Is Live on PlayStation®4! Trove’s PlayStation®4 Open Beta is now live and we couldn’t be more excited! Login today and explore vast worlds of adventure with players from all around the globe. Join up with others to take down the toughest challenges Trove has to offer or build the greatest creations the game has ever seen. It’s easy to check it out right now – Trove is free to play! Trove’s Open Beta is an early look at the game that we’ll be launching on consoles in the coming months. We have more work to do before we’re ready for prime time and we need your help! We have our own road map of what to improve between this Beta test and launch, and your feedback is vital to helping us stay on the right track. We’d love to hear what you think about the game as it is today and how you feel about the things we have in store. The dev team will be updating you regularly with everything that’s going on between now and launch! What makes Trove Beta awesome? You do! Trove is loaded up with thousands of player created items such as hats, costumes, weapons, mounts, allies (pets), and dragons. It’s an open Beta test so everyone is welcome to join us! One of the things we’re working on is an improved control scheme and your feedback will help shape how the game is played. Create Clubs (similar to guilds) with your friends and build wonders beyond imagination together. Club Worlds are open spaces for building that cannot be modified by visitors. If you’re more of a fighter than a builder we’ve got you covered. Explore our vast adventure worlds to take down enemies in the open world or in our massive selection of dungeons. Pick from 14 unique classes to suit your style. For those of you who want to test your mettle against other players we have a multitude of “Capture the Flag” and “Team Deathmatch” arenas as well! Trovians who choose to pitch in their support by spending any amount of money in the Trove Store during Beta will also receive a legendary dragon, Disaeon the Immortal, as our way of saying thank you! Legendary dragons are extremely cool mounts that allow you to run at high speed and glide through the air even more quickly. They aren’t just cool for speeding up your adventures, but you can also use them to launch powerful ranged attacks from the sky. But wait, there’s more! Progress made during the Beta test will be carried over when we go live – don’t wait to start your adventure. We’ve just scratched the surface of what is possible in Trove. Install the Beta now and take it for a ride around the block – get it? Just like Trove, that comedy is also free. Join the discussion on our PlayStation 4 Trove Beta test forums.